15 hand, awesomely built 6 year old sorrel gelding. Grandson of SMART CHIC OLENA and also has Mr. San Peppy and Hancock on his papers. Looks like a BRAND NEW PENNY with a pure WHITE mane and tail. Branded on the left hip "Circle JP". 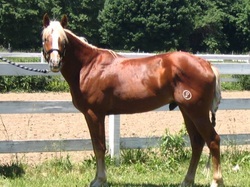 20 months Professional REINING Training with Thomas Performance Horses (Saginaw,MI). Has been shown at the congress and at local shows. Was Gelded 4-16-10. Up to date on all shots and farrier work. Has been working cattle, been roped off of and started on the barrel pattern. OPEN TO REASONABLE OFFERS more pics available upon request * CURRENTLY BEING RIDDEN BY A 10 YEAR OLD GIRL AND ALSO COMPLETE BEGINNERS* and as of 9-1-11 has been started into our lesson program for both reining and hunter work at MKQH.